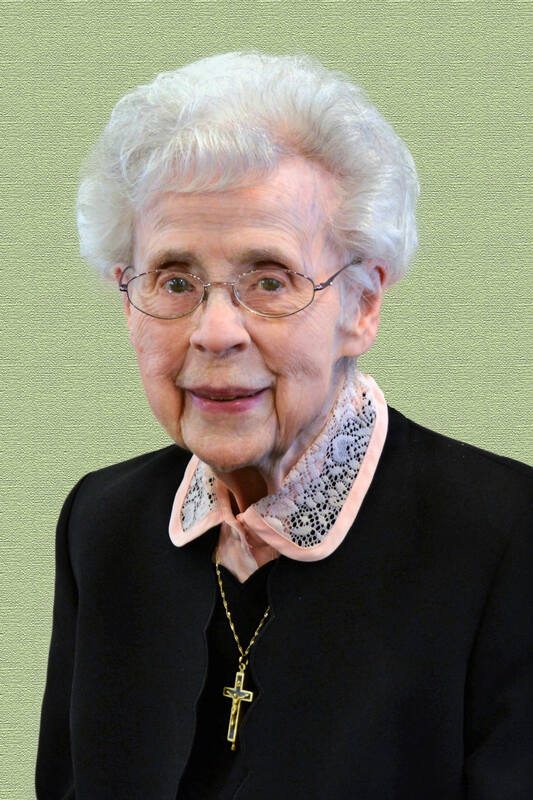 Sister Mary Cordia Grimes, CSJ, 98, died Wednesday, August 23, 2017, at the Motherhouse of the Sisters of St. Joseph in her 80th year as a member of the Congregation. The daughter of Patrick J. and Agnes Cain Grimes, Sister entered the Congregation from St. Titus Parish, Aliquippa. Born into an Irish Catholic family of six children, Sister Mary Cordia was one of three girls who became Sisters of St. Joseph. For more than 35 years, Sister Mary Cordia ministered as a teacher in the dioceses of Altoona-Johnstown, Greensburg, and Pittsburgh. She taught at Bishop McCort High School, Johnstown (1943-51, 1971-75), Bishop Guilfoyle High School, Altoona (1952-57), and Greensburg Catholic High School, Greensburg (1975-77). She also served as principal at Annunciation High School, North Side (1957-59), and as Assistant Principal at Bishop Carroll, Ebensburg (1961-63), and Fontbonne Academy, Bethel Park (1963-1971). In 1977, Sister Mary Cordia transitioned from teaching children to caring for senior sisters, and her warmth, kindness and gentleness overflowed into her new ministries. As coordinator of St. Bernard Convent in Mt. Lebanon, she opened a large residence for retired and semi-retired sisters and remained there for eight years. For the next decade, she served as Motherhouse Coordinator of the Infirmary. In recent years, she volunteered at the Motherhouse and Villa St. Joseph. Regarded as an excellent teacher and administrator, Sister Mary Cordia was known for her graciousness, deep spirituality, and listening heart. Many Sisters say that Sister Mary Cordia radiated the joy of religious life and credit her for nurturing their call. “Our religious life as a Sister of St. Joseph was modeled by sisters like Mary Cordia,” wrote one sister. “You could not help but feel the tug of the spirit in her presence.” Sister Mary Cordia often spoke of the profound spiritual influence of her parents who valued the importance of praying the rosary daily and attending Mass as a family. Sister Mary Cordia is survived by nieces, nephews, grandnieces, and grandnephews, the Associates, and the Sisters of St. Joseph of Baden. She was preceded in death by her parents Patrick J. and Agnes Grimes, brothers, John, Patrick, Joseph, and sisters, Brigid and Ursula. Friends will be received Sunday, August 27, from 1 p.m. to close of the Prayer Vigil and Monday, August 28, from 11 a.m. to 3:30 p.m. Prayer Vigil will be Sunday, August 27, at 6 p.m. at the Motherhouse. Mass of Christian Burial will be offered Monday, August 28, at 4 p.m. in the Motherhouse Chapel. Burial will follow in the Sisters’ Cemetery on the Motherhouse grounds. Donations in the name of Sister Mary Cordia may be sent to the Sisters of St. Joseph Memorial Fund, Development Office, 1020 State St., Baden, PA 15005. Make a gift in memory of Sister Mary Cordia.